We are a local family owned business, selling directly to the public. Our showroom features a full line of porcelain, ceramic, glass, & natural stone tile. 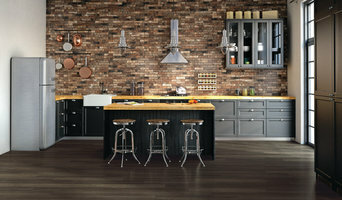 We have a variety of new high definition porcelain tile from contemporay to rustic designs. 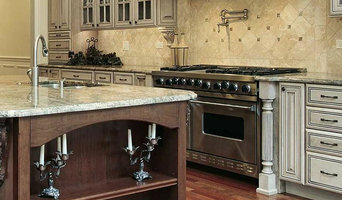 We specialize in custom Slab Countertops in Granite, Marble, Travertine, & Quartz for kitchens, bathrooms, & fireplaces. 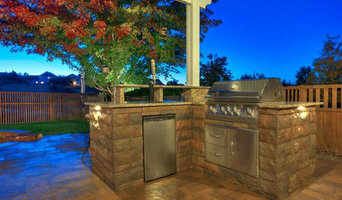 We also build custom outdoor kitchens. Our knowledgeable and friendly staff will work to understand your project needs and offer design and installation ideas. We guide and support do-it-yourself projects with proven tips and a full line of tools and setting materials. If you would rather shop, fish, or play golf; our installation team will quickly transform your project ideas into a beautiful addition to your home. Don't miss asking about our tile shower epoxy Make-Over's!! Molding mud has been creating high-quality, fine residential concrete product for over 15 years. Our work is featured in some of the finest homes, hotels, restaurants and offices in Jackson Hole, Seattle, and Boise. We have been featured on HGTV and DIY Network, creating custom concrete works of art. We make everything by hand, from countertops, sinks, bathtubs, firetables, dining room tables, outdoor kitchens, fireplace surrounds, tile, wall panels, wall caps, concrete wall coatings, and anything else you can dream of. Molding Mud strives for 100% customer satisfaction and enjoys helping design custom, awe-inspiring artisan pieces. We have a long reference list from the finest architects, interior designers, home owners and contractors in the west. Dave believes that concrete is the ultimate medium due to its ability to be molded into infinite shapes, allowing him to create beautiful, but functional works of art. The name Molding Mud comes from the transformation of concrete. Ada County's Vast Selection of Stone, Tile, Porcelain & More! JL Granite & Marble, Inc.
At JL Granite & Marble, Inc. we go the extra step to make sure you have the highest quality. We specialize in designing, fabricating, and installing solid surfaces for remodels, new construction, and businesses across the Treasure Valley and throughout the Northwest region. We work with home owners directly, builders, designers and contractors to make dreams come true. During the initial consultation we will discuss pricing, design options, and projected install dates to accommodate your schedule as much as possible. Rocky Mountain Tile & Stone is committed to providing the best customer service and highest-end countertops and tile in the Treasure Valley. Our state-of-the-art showroom and fabrication shop enable us to deliver a full luxury experience to every client. We are a local family owned and operated Treasure Valley business that specializes in custom tile and stone installations. We have been in business and serving the Treasure Valley since 2001 and specialize in everything tile. From custom tile showers to tile backsplashes, we can help you with all your tiling needs. Doing it right costs less than doing it over. Family owned and operated, we are a full service granite fabrication and installation shop. If you are building or remodeling in Boise, Eagle, or the surrounding areas - Uptown Stone would love to be your resource for custom granite countertops. In Spring of 2013, Uptown Stone completed 10% of the Eagle Parade of Homes granite jobs! We handle commercial jobs like the Riverside Apartments and Treasure Valley Hospital. If that isn't enough, a short list of neighborhoods we've installed in should give you a good idea of our work quality: Lakemoor, Silver Creek, Island Woods, Vizcaya, Two Rivers, Pine Lakes, Saguaro Canyon, Etc. We offer start-to-finish solutions for every project at a competitive price. Give us just one chance and receive our new account price promotion along with quality work and dependable service you won't receive anywhere else in town. Rocky Mountain Granite and Tile started 30 years ago as Rocky Mountain Tile with just 2 employees. Over the years, we have grown to as many as 35 employees and have been lucky enough to work on some of the most custom homes in the treasure valley and surrounding areas. Custom residential is our specialty but not the only thing we do. Our craftsman can handle the largest commercial projects too. Along with our tile crews we also have a full service granite fabrication facility where we can fabricate granite kitchens, vanities, showers, or even outdoor BBQ’s. Remodels are made easy with the support of all the necessary trades, such as plumbing, electrical, sheet-rock, finish work, framing, cultured stone, glass doors and panels, etc. Hands on is our style and Mike Streeby has extensive experience with design and helping you bring your idea into fruition. Whether it’s a kitchen backsplash or redesigning an entire master bath, Mike can guide you through the process from start to finish. Stone Pro delivers premium quality design, fabrication and installing of natural stone as well as expert refinishing and preservation of existing granite. Stone Pro is prepared to meet all your stone fabrication needs. We utilize the most advanced technology and our own unique personal touch to produce each project. We're a family-owned company serving the entire Boise, Idaho metro area, including Eagle, Meridian, Star, Nampa, Caldwell and the surrounding areas. We even have happy customers located in McCall. If you can dream it, CB Tile can build it! Check out our portfolio. Whether you're remodeling the tile for your bathroom, kitchen, patio, flooring, walk-way or counter-tops, CB Tile and Stone can assist you in the entire process from design through installation... we make easy! We fabricate and Install both granite countertops, and engineered Quartz countertops. We fabricate and install kitchens, baths, showers and outdoor kitchens as well. We start out with a bid for the fabrication and installation. Once we figure out the amount of material you need we will visit our local slab gallery to pick out your material. Next we will template your kitchen or bath and go back to the shop and start the fabrication process. Next we will install the countertops, it usually takes about 10 days from start to finish. Worktop installers and tilers in Boise, ID can advise on the best tiles and materials to use based on your tastes and requirements and then will be able to install them to a high finish in your home. Kitchen worktops are a major part of your kitchen – you need surfaces that will be scratch and heat resistant, but at the same time still look attractive and work in harmony with your kitchen units, splashback and other kitchen elements. A worktop manufacturer and installer will be able to fit new kitchen worktops or replace old ones with ease, helping you to pick out the best kitchen worktops for your home first. Tiles are so versatile that they can be used in kitchen splashbacks, floors, bathroom walls and as decorative designs elsewhere in the house. Tile manufacturers and tilers in Boise, ID will have a great range of tile designs, sizes and materials to choose from and will help you to pick the best tile for the job. Laying tiles may look easy sometimes, but one badly laid tile can ruin a whole floor or wall, so it’s really best to leave it to a skilled tiler. With Houzz you can find Boise, ID tilers, tile manufacturers and worktop installers near you and check their previous projects, reviews and ratings to decide if they’re a good fit for your home design project. Why should I hire worktop installers or tilers in Boise, ID? Perfectly laid tiles and worktops can look simple and seamless once finished, but installing them is far harder than it looks. It really pays off to hire a Boise, ID tiler or worktops professional as they will have the experience and expertise to finish the job efficiently, quickly and to a high quality. From metro bathroom tiles and porcelain tiling, to kitchen worktops, splashbacks and travertine floor tiles, there will be a tiler or worktop professional who can install the surface you need for your bathroom or kitchen design. There will even be tile and worktop repairers to help you if you need a quick fix-up to your surfaces. Tile manufacturers, worktop professionals, and often tilers in Boise, ID themselves, will also be able to advise you on the right materials to use if you’re not decided on one particular type. They can tell you the advantages of the different flooring, wall tiles and kitchen worktops so you can make the right decision for your home. If you’re after a bespoke tile pattern, mosaic or mural created and laid in your house, this will also be possible with Houzz as we list such a wide range of tile manufacturers, worktop professionals and tilers in Boise, ID. It could be the case that you can find a design or construction company that can offer tiling and worktops as part of their work, whilst also undertaking other projects for your house redesign, so it’s worth looking out for these professionals, too. Here are some related professionals and vendors to complement the work of tiles, stone & worktops: Interior Designers, Architects & Building Designers, Main Contractors, Kitchen & Bathroom Designers, Design & Build. Find a tiler or worktops professional on Houzz. Narrow your search in the Professionals section of the website to Boise, ID tilers and worktop installers. You can also look through Boise, ID photos to find projects you like, then contact the contractors or tilers in Boise, ID who worked on the tiling work or kitchen worktops.